Forge high flow single piston valve kit for k03 seat leon cupra 2.0 tfsi. This product sheet is originally written in English. Please find below an automatic translation into French. If you have questions please contact us. Single-piston high-speed valve kit for k03 seat leon cupra 2.0 tfsi - forged fmdvhftfsi when buying, please indicate your choice of pipe color as a note on your order from the list below: black pipe blue pipes red pipes. A high-flow vacuum operated single-piston valve for audi, vw and seat (vag) 2.0 liter petrol engines with the k03 turbo (the oem valve is mounted directly on the turbo). Designed primarily to ensure high volumes are unloaded quickly. This valve is for atmospheric use. In the box: 1 x fmdvhftfsi valve 1 x vw plastic pipe (1ko14577op) 1 x wiring harness / associated 1 x solenoid valves, support and screws 1 x shutter 1 x 2000mm vacuum tube 4mm 1 x pcv adapter kit 1 x silicone straight (25 x 65 mm) 1 x silicone hose elbow # 1187 hose clamps 2 x 35mm hose clamps 2 x 45mm 1 x vacuum valve, seals and bolts. 10 x cable links 1 x instructions 1 x forge sticker. About forge motorsport forge motorsport was founded in 1994 with the simple ideals of manufacturing according to the standards of quality, innovation and intelligent design. Their mantra is the best customer service and service in the world. In doing so, they have developed the widest range of replacement replacement parts blow / recirculation valves, intercoolers and actuators in the world. We try to reply to messages within 24 hours. If you do not receive an answer within 24 hours please send us another message. We post worldwide, so please contact us if you need a quote. To pay an international order, please purchase the item and we will adjust the charges before payment. Please be aware that some of our items are made to order and can carry up to 14 days. Information on the deadlines for all made to order items will appear in the product description. Our goal is to deliver stored items in 3-5 business days depending on the time of order and the availability of our suppliers. If you are still waiting for your product after 10 working days, please contact us so that we can follow your item. Upon receipt of your order, you will be asked to sign for the goods received in good condition. If the package does not seem to be in good condition, then please refuse the delivery. If you can not activate the content at the time of delivery please sign for the parcel as "deactivated". Failure to do so may affect any warranty claim you make thereafter. If you wish to return your item please check that you are in the return period and contact us to arrange a return and refund. All items must be inspected upon return and a full refund will be issued only if the item is in satisfactory condition. We will be unable to offer a refund for the damaged goods. The item "forge high flow single piston valve kit for k03 seat leon cupra 2.0 tfsi" is for sale since Friday, March 23, 2018. 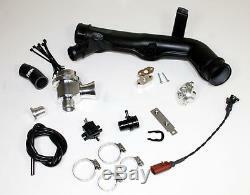 It is in the category "auto, motorcycle parts, accessories \ auto \ spare parts \ systems" exhaust \ others.
" The seller is "wg_motorparts" and is located in rochester. This item can be delivered anywhere in the world.